When you look for a scrub top, you’re looking for one to fit your masculine build; not a frilly feminine one, or even a bulky unisex one. We know that, and that’s the reason why we have so many options of men’s medical scrubs, for men only. 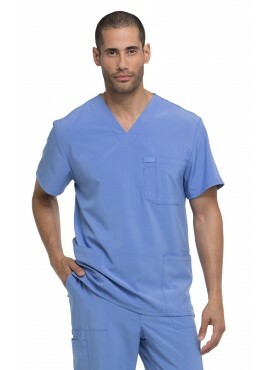 These male scrub tops were specifically designed to fit a guy’s frame and make you look good, allowing you to feel confident and self-assured, with the knowledge that you’re making the right impression. As healthcare professionals, a practical nurse uniform is an important way to help your day run as smoothly as possible. Functional features in our scrub tops include bungee loops, spacious pockets for easy access to your medical instruments and personal items, side vents for easy motion, and many more smart details, to make your work more pleasant. 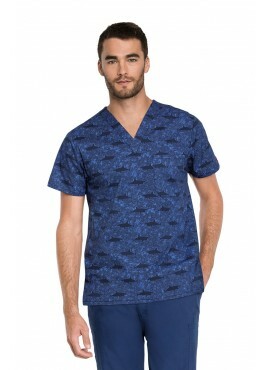 Comfort is very important to us, because we know that a comfortable medical professional is a happier medical professional.Our carefully curated collection of top quality, practical men’s scrub shirts include many highly comfy options that will keep you feeling your best, inside and out, throughout your busy shift. Be it a Cherokee Workwear Stretch Scrub Top, a men’s tall scrub top from Landau’s, or a basic men’s underscrub tee for layering, every single man is bound to find something that will fit his body type, style, and work needs. Scrub tops are the uniform shirts worn by physicians, surgeons, nurses, and many other individuals employed in the healthcare profession. In many healthcare facilities, the members of each department wear a different color uniform, so that patients, visitors, and employees can differentiate between departments. Surgical scrubs, worn by those who assist during surgeries, are typically light grey, light blue, light green, or a light blue-green hue. 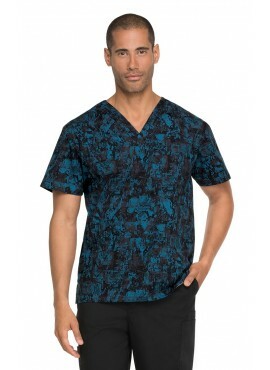 Printed scrub tops are often worn by men working in nursing homes, since many times they don’t have a specific color code. Before you choose a scrub shirt, be sure to find out if your department has a color code, and what it is! The flexible design of these men’s scrub tops, which are slightly more roomy than the modern style scrub shirts, allows for maximum comfort. With these scrub tops, you won’t feel that uncomfortable pulling every time you bend down to tie your shoes, or when you take something off a high shelf. Also known as Modern Classic or Traditional, these scrub tops ensure your comfort without the bagginess that may come to mind when you think of “men’s scrubs”. 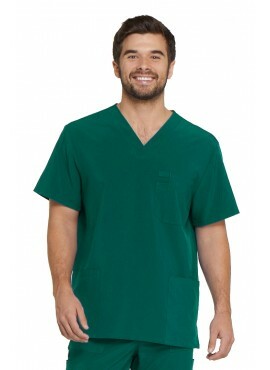 Contemporary or Modern style men’s scrub tops are fitted closer to the body, and emphasize the slimness of your build. These scrub shirts typically come with innovative recent features such as antimicrobial or fluid-resistant technologies. Unisex scrub tops boast a roomier fit all around. Although not exclusively for men, with a looser chest and waist area, as well as wider sleeves and armholes, they are the optimal choice when it comes to finding scrub apparel that will never have you feeling constrained. There’s no need for today’s male medical professionals to stick with only basics when there are countless fabulously practical features to choose from! In today’s medical world, convenience is the code word, and the available nursing uniform shirt details are more functional than ever before. Choose the features that will make your day more pleasant. Antimicrobial Properties: Antimicrobial technologies stop germs from spreading, by preventing bacteria from growing on your scrub top. They also prevent stains, and inhibit odors. 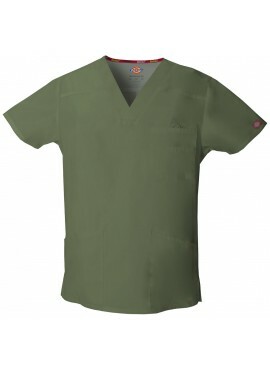 With antimicrobial scrub tops, you can feel fresh, clean and confident even at the end of a long shift. Moisture Wicking: Scrub shirts with moisture wicking properties are fluid resistant, ensuring that you stay fresh and dry throughout the day. Side Vents: Many competent nurses consider side slits to be mandatory, and there’s a good reason why. Side vents allow for busy nurses to move around as quickly and as efficiently as possible, without any uncomfortable pulling at the waist. Double Needle Topstitching: This helps necklines and hems to stay in place, and gives the scrub top a crisp edge. If you’re interested in extended longevity, and you like looking professional, you’ll love this feature. Media Cord Keyhole: This innovative feature is a wonderful asset to any tech-savvy nurse. It allows you to stay in touch with the world even while working your hardest to better lives. There are many more popular features available too, such as bungee loops, shoulder yolks, and wrinkle-resistant properties. If there’s such a feature on men’s scrub shirts, chances are, you’ll find it at Murse World! Some of the most versatile scrub shirts, positively loaded with features, include our Grey's Anatomy Men's 0107 V-Neck Scrub Top, the Landau Men's Media Stretch Top 4142, & the famed WonderWink Men's WonderWORK Multi-Pocket Top 103. Choose from these, or browse our site for even more feature options! The fabric can really make a difference to your day. A scrub shirt’s material can enhance or decrease your comfort level, the washing time, and the scrub shirt’s longevity. When it comes to comfort, cotton is king. It’s soft and comfortable, no matter the season. Cotton fits nicely on the figure, and is easy to care for. However, it can shrink, and it wrinkles easily. Quick Care Tip: Launder in cold or hot water, and lay out to dry. If you’re looking for a quality, long-lasting nursing uniform shirt that isn’t likely to shrink or stretch, a polyester scrub top may just be your best bet. Polyester drapes well on the body, and dries quickly. The texture is slightly rougher than cotton, and it can get staticky. Quick Care Tip: Wash while turned inside out in warm water, and use fabric softener. Line dry, or dry on low with a dryer sheet. Spandex is a breathable fabric with a comfortable stretch that will always bounce back into shape. It wicks away moisture and perspiration and keeps you looking and feeling fresh. Spandex has a slightly rough texture which is not usually prone to shrinking. Durable and dyeable, Spandex is a great lightweight fabric option. Quick Care Tip: Spandex can be machine washed and dried. Wash in warm water, and dry on medium. Rayon is an amazingly absorbent fabric that appears and feels soft and silky. It drapes well on the body, and is durable even as it is comfortable. It does wrinkle easily, though, and it may stretch or shrink. At Murse World, we do our best to provide every male in the healthcare industry, regardless of style or budget, with a scrub shirt that exceeds his expectations. Our scrub prices range from a low price of only $10 to $50, with quality Dickies and Cherokee Scrub tops beginning at a budget-friendly $11.99, and the higher-end designer pieces priced up to $50. No matter what you are looking to spend, you can find a well-priced, practical scrub shirt that meets your price point. The absolute best way for your medical uniform to look just right is to find the size that fits you best. And here’s how to discover that perfect size! First, stand against a wall and make a small pencil mark on the wall immediately above your head. Once you’ve done that, you can measure the distance from the floor until the dot you just made on the wall. That measurement is going to be your height! Now for your chest. Take in a deep breath, breathe out, and then pull the measuring tape around the shoulder blades, under the armpits, and then over the fullest part of the chest. One more step, and you’re done! Last step is your waist. Bend sideways, and as you’re bending, measure the circumference of your waist with a measuring tape. Once you’ve completed the steps in this Male Scrub Top Guide, you’re all set to finding the perfect medical top! Simply check the sizing chart for the scrubs you want and choose accordingly! 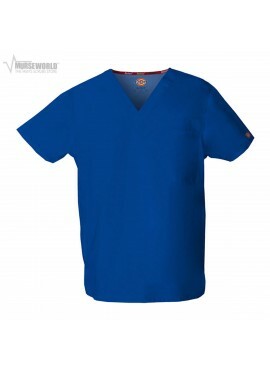 Browse today, and you’ll see that at Murse World, shopping for male nurse uniforms is quick and easy. Questions? Compliments? 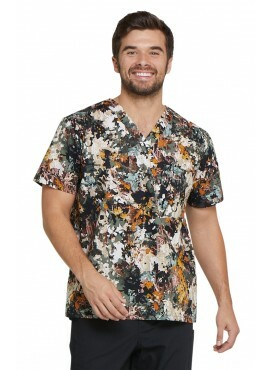 Or perhaps there are still too many cool scrubs for guys for you to choose from? That’s no problem; just dial us at 888-501-4221, and let our friendly customer representatives assist you in finding the perfect scrub to suit your needs. © 2017 Murse World, Inc. All Rights Reserved.